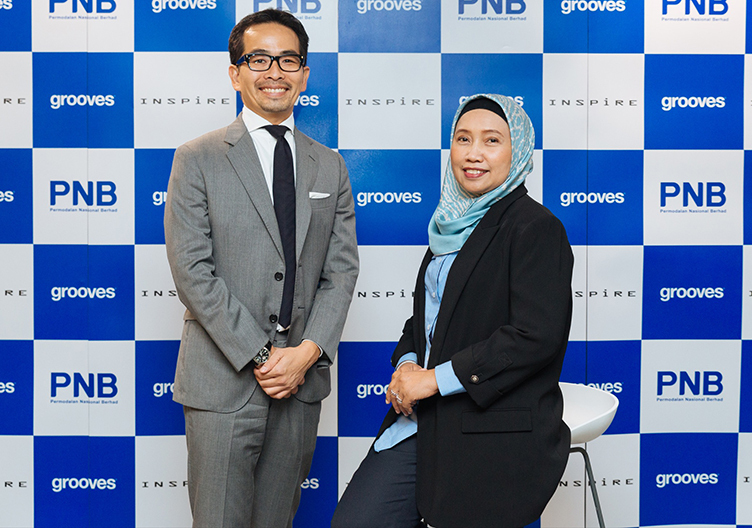 GROOVES on Jan 24 received an investment worth USD$920,000 (approximately RM3.78 million) from PNB-INSPiRE Ethical Fund (PIEF) to connect talents within Malaysia and other Asean countries to job opportunities in Japan. This strategic investment will help Grooves to expand its services globally to cater to the Asean market, starting with Malaysia. PIEF, incorporated in 2015 with a fund size of JPY5,150 million, is the first Syariah compliant private equity fund in Japan established to facilitate the expansion and introduction of Japanese SMEs with innovative technologies to Islamic and Asean countries as well as to support and facilitate the expansion and introduction of Syariah-compliant businesses, amongst others. Organisation for Small & Medium Enterprises and Regional Innvovation, Japan (SMRJ) is the biggest investor with about 46% shareholding and PNB Equity Resource Corporation Sdn Bhd owns about 20% shareholding in the fund. Other investors are Oita Bank Co Ltd, The Hiroshima Bank Ltd and Fuyo General Lease Co Ltd. Founded in Japan, Grooves is a human resources tech (HR Tech) startup platform which aims to be the bridge connecting worldwide talents looking to advance their career in Japan with job opportunities in Japan. Grooves has over 15 years of experience in Japan and currently has over 5,000 listed Japanese corporations within its platform. Its huge network and strong alliance help provide a wider range of career opportunities to Grooves’ users. Grooves sees the potential in the Asean region, especially Malaysia, and is looking to connect motivated talents to corporations in Japan through its platform and match the right applicant to the right employer. “We are proud to announce that, with the investment received from PIEF, Grooves is ready to expand our operations to the Asean countries starting with Malaysia. We would like to express our gratitude towards PIEF for the confidence in Grooves. “Malaysia was selected as our headquarters because we saw the potential in terms of its talent pool and we are confident that it would be a good starting point to penetrate the asean market” said Grooves Inc chief executive officer Yukihiro Ikemi. “Grooves is not just a one-way bridge for Malaysian talents to penetrate the Japanese job market. The idea here is to have the local talents learn about Japan’s business ecosystem and bring back the knowledge as well as experience to their respective countries. Grooves wants to provide the opportunity for both countries to exchange work culture and skills” added Ikemi. The quickly ageing nation faces huge gaps in its workforce. Now, Japan is taking historic steps to lower barriers for foreigners in a place that has long been resistant to immigration. The driving force is its demographic change: Japan’s population is ageing rapidly and shrinking. As the country prepares for the 2020 Tokyo Summer Olympics and Global Expo 2025, Japan is looking for foreign workers to fill up job vacancies. Understanding this situation, Grooves aims to provide new solutions to eliminate talent shortages in Japan by promoting the creation of unique talent networks in Asean to provide Japanese companies with highly motivated and talented people from around the Asean countries. “Not many Japanese have actual experience working and living together with foreigners but the Japanese are starting to understand that something must be done to change this. We will continue to match highly skilled talents from the Asean region to suitable job opportunities in Japan and we hope to create a community where talents can discover their career through the Grooves network” said Ikemi. Grooves has raised over USD$10 million through multiple venture capitals (VC) and expanded to Malaysia in January 2018 to establish its services and operations in the country.